Need answers about the exact type of concrete anchor and bits required for use in an application? Information and a brief description about the different types of concrete anchors and bits is now available. Click on any picture to be redirected to a page that will contain in-depth information about the anchor and bit. CONFAST® Wedge anchors are designed to be used in solid concrete. They should never be used in CMU block or brick base material. These anchors are available in a wide range of diameters ranging from 1/4” to 1-1/4”. The anchor lengths, which depend on the diameter, are from 1-3/4” to 12”. All CONFAST® wedge anchors come packaged with the correct size, type, number of nuts and washers. All sizes are in stock will ship from our Cleveland, Ohio warehouse the same day that the order is received. The CONFAST® Sleeve Anchor is the most versatile type of masonry anchor. It is designed for use in a variety of base materials that include solid concrete, brick, block and mortar joints. Available in a variety of diameters, lengths and head styles, this anchor will meet most application requirements. Packaged, assembled and ready to use, all sizes are in stock and will ship the same day orders are received. Order online to receive free freight. Tapcon® masonry fasteners are ideal for use in solid concrete, brick, block and mortar joints. They are available in two diameters of 3/16” and 1/4”. Their two head styles are either hex washer head slotted or phillips flat countersunk. They are manufactured in a variety of lengths in order to meet most application requirements. These versatile anchors are made in America, and will ship from our national warehouse on the same day that the order is received. Buy direct and save money! The CONFAST® Masonry Screw Anchor tap threads directly into a predrilled hole in concrete, brick or block. With two head styles to choose from and a variety of lengths, the CONFAST® screw is a versatile, light duty fastener. Each box of 100 CONFAST® screws are packaged with the proper diameter and length carbide bit. Every type and diameter is in stock and will ship the same day an order is received. The CONFAST® Drop-In Anchor can be used only in solid concrete, and should never be used in base materials such as brick or block. The designated diameter refers to the inside bolt or threaded rod diameter used in conjunction with the anchor. A setting tool is required to set the drop-in anchor in the concrete. Bolts are not included with the purchase of the drop-in anchor. Orders placed online will be sent with free freight. The CONFAST® Machine Screw Anchor is for applications in concrete, brick or block, and are available in a wide range of diameters. Each anchor diameter comes in one length only. Please note that a setting tool is required to set the anchor in the base material. Bolts must be purchased independently since CONFAST® does not stock any type of bolts. The CONFAST® Leadwood Screw Anchor is a light duty masonry anchor. It requires the correct diameter sheet metal screw to expand the anchor and to attach the fixture. The diameter of the sheet metal screw is equal to the designated diameter of the anchor. No special tools are required to set the anchor. All seven diameters are packaged in boxes of 100; all screws must be purchased separately. CONFAST® Single Expansion Anchor is available in six different diameters. Each diameter has only one length. The anchor is versatile and can be used in most masonry base materials. The bolt diameter used to expand the anchor is equal to the designated anchor diameter. Single expansion anchors are designed for use in dense hard base materials, such as red brick. Buy online to earn free freight. There are six diameters of the CONFAST® Double Expansion Anchor. All diameters can be used in most masonry base materials. They are ideal for use in softer, more suspect base material because the anchor expands along its entire length. The application requires a threaded bolt that has national coarse threads, which must be purchased separately. The CONFAST® Lag Shield Anchor comes in six diameters and two lengths (short or long). The application requires the use of a lag screw that is equal to the diameter of the anchor being installed. The short lag shield is for use in harder masonry base material; the long lag shield is for use in softer masonry base material. The CONFAST® Nylon Nail-it is available in three different head styles of mushroom, round, and flat counter sunk. It is manufactured in two diameters of 3/16" and 1/4". Each anchor comes pre-assembled and ready to install. They are packaged in 100 pieces per box. This light duty fastener can fasten items to brick, block or solid concrete. All sizes are in stock, with free freight for online orders. The CONFAST® Metal Hit Anchor is a light duty masonry anchor that can be used in block, brick or concrete. Note that it should never be used in overhead applications. It is available in a mushroom head. Once installed, they are tamper resistant. The anchor comes packaged in 100 pieces per box with two diameters and eight different lengths to meet most application requirements. The CONFAST® brand Split Drive Anchor is specifically designed for use in solid concrete, and should never be used in block, brick or mortar joints. They are available in two diameters, seven lengths and two head styles of round or flat. The flat counter sunk style is perfect for fastening wood to concrete floors during the installation of many types of flooring. All sizes are packaged 100 pieces per box and 1000 pieces per case. The CONFAST® brand Strike Anchor is a light to medium duty anchor for use in solid concrete. Ranging in diameters from 1/4" to 3/4" with several lengths for each diameter, it is manufactured as yellow zinc plated and packed with a nut and washer. All sizes are in stock in the Cleveland, Ohio main warehouse, and will ship complete the same day the order is received. The CONFAST® Straight Shank Hammer Bit is for use in hammer drills that require a chuck key to tighten the bit into the chuck. It is available in diameters from 1/8" to 1-1/4" and in many different lengths to meet most application requirements. All Straight Shank Hammer bits are in stock and will ship the same day the order is received. CONFAST® SDS carbide bit are designed for use in SDS keyless chucks. They range in diameters from 5/32" to 1-1/4" and lengths from 4-4/8" to 48" depending on the diameter. The carbide tip is brazed in to the end and the flute is designed to extract the concrete dust at a rate that optimizes drilling speed. Order on line for free freight, every order will ship the same day the order is received. The Tapcon® bit is designed specifically to be used in the installation tool kit that may be used when installing Tapcon® and CONFAST® masonry screw. It can be directly chucked into any standard type hammer drill, i.e., a chuck that requires a chuck key. They are available in two diameters and 8 different lengths to accommodate all sizes of the Tapcon® or CONFAST® screw. CONFAST® stocks and sells the entire SDS Max bit line, ranging in diameters from 3/8" to 2" and in lengths from 13" to 36". The SDS Max bit fit into all hammer drills that accept the SDS Max configuration. The drilling depth of the SDS Max bit is 6" to 7" shorter than the designated length. The flute is designed to extract the dust created during the drill process quickly to allow for maximum drill speed and performance. 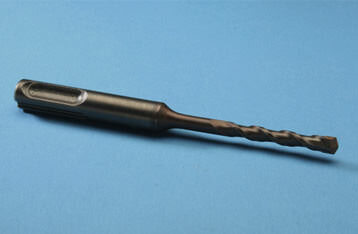 The CONFAST® Spline Bit meets ANSI standards and can be used for drilling holes in concrete for concrete anchors. The effective drilling depth of all Spline bits is equal to 6" shorter than the overall length of the bit. The flute is specifically design to maximize dust removal, allowing for maximum drill speed. All bits are in stock and ship the same day the order is received.